The African American Film Critics Assn. has dubbed Jordan Peele?s social thriller ?Get Out? the best movie of the year. The film also won honors for directing, acting (for lead Daniel Kaluuya) and screenplay. Other films receiving awards or landing on the group?s top 10 films list of the year were ?Three Billboards Outside Ebbing, Missouri? for lead actress Frances McDormand, ?Last Flag Flying? for supporting actor Laurence Fishburne and ?Girls Trip? for supporting actress Tiffany Haddish and best comedy honors. ?The films released in 2017 captured a plethora of lifestyles, experiences and emotions that allowed our members to engage with a different range of storylines from previous years,? AAFCA co-founder and President Gil Robertson said in a statement. ?The success of ?Girls Trip,? the first R-rated film starring an all black female cast to surpass $100 million, and ?Get Out,? Jordan Peele?s directorial debut which surpassed $250 million worldwide, prove just how viable black films are across the board.? 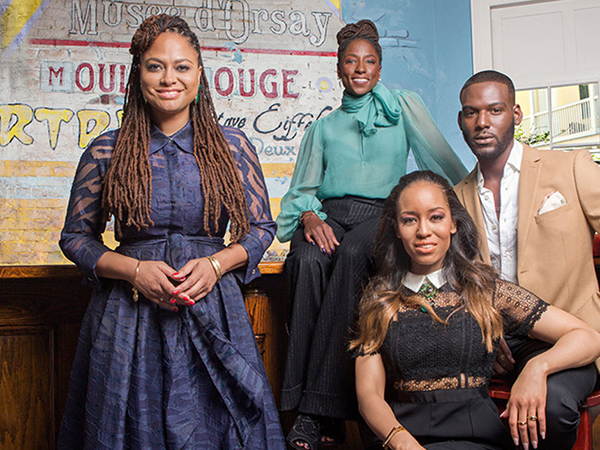 On the television side of things, Ava DuVernay?s ?Queen Sugar? nabbed top TV drama honors, while ?black-ish? took best TV comedy. Other shows recognized on the organization?s top 10 TV shows list included ?Insecure,? ?Master of None? and the now-canceled ?Underground.? ?AAFCA?s Top 10 lists in Film and TV represent the organization?s commitment to an expanded analysis of both mediums,? said AAFCA co-founder Shawn Edwards. ?While content targeting black audiences dominates both charts, AAFCA is pleased to acknowledge and recognize content that represents the global community. This wave of new content thrives in an environment where multiple voices are welcomed and championed. Inclusion is a win for everybody.? Best director: Jordan Peele, ?Get Out? Best actor: Daniel Kaluuya, ?Get Out? Best actress: Frances McDormand, ?Three Billboards Outside Ebbing, Missouri? Best supporting actor: Laurence Fishburne, ?Last Flag Flying? Best supporting actress: Tiffany Haddish, ?Girls Trip? Best independent film: ?Crown Heights? Best foreign film: ?The Wound? Best TV series (comedy): ?black-ish? Best TV series (drama): ?Queen Sugar? Breakout star: Lakeith Stanfield, ?Crown Heights,? ?Get Out? ?Three Billboards Outside Ebbing, Missouri? ?Call Me by Your Name? Happy 55th Birthday, Mr. President!